that leads to a ruined ecstasy. and the slow burn of tobacco between them. and fell upon bare shoulders. if he ever smelled the gunpowder. and ache, yes, as I reach for my faith. for mercy, yes, and love. In honor of my mother, who unexpectedly passed April 14/18. And I, in another country, mourn her. Published works, synopses, and reviews. Thank you. Fifty-seven years ago, a young man named Euart Monroe came back home. Only two people knew what happened to him. Years later, the man responsible for Euart’s fate is paid a visit. But is it Euart’s ghost? Or is it the boy grown up seeking retribution? Welcome to Handsome, OK, population 883 and fading. It’s a place where some men bury their mistakes, a town on the edge of becoming a ghost. And so begins the most terrible summer for Charlotte Windover. She and husband Jeremiah began a new life together surrounded by a wide expanse of a corn and sky. After years of brutal disappointment, she finally resolves to change her life. When Jeremiah is suddenly killed at an abandoned homestead, life becomes more isolated and harrowing. And with the threat of random fires being set by a mysterious figure known only as Croy, Charlotte’s life has become even more desperate. In a land of big skies and small dreams, A Very Tall Summer is the tale of a woman’s resolve to overcome her broken past, and at any cost. Maggie Day is a pregnant young woman who escapes to the only place she’s ever felt safe. As she copes with past tragedies and trauma, she is guided by her grandmother, who helps her discover courage and self-respect. Maggie is a tale of love and strength, and of overcoming the wounds of a dark past. 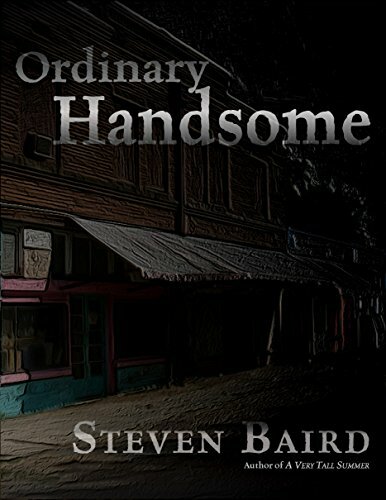 Author Steven BairdPosted on March 12, 2018 March 5, 2019 Categories A Very Tall Summer, Cover art, Fiction, Handsome, indie author, Miscellaneous, Novel, novelist, novella, ordinary handsome, Paperback, review, Writer, WritingTags A Very Tall Summer, Design, Fiction, indie author, Maggie, Novel, Ordinary Handsome, reviews, Writer, Writing11 Comments on Ordinary Handsome, et al. This is a place of unremarkable geometry, of hand hewn beams and reclaimed cabinets, of cotton curtains and poplin tablecloths.There are stout lines built around her silly feminine froth. You might savvy her girlish moods: the bright New Orleans yellow in the hallway, or maybe the baby doll figurines on the bookcase. But don’t forget, this is my home, and it is a place of unremarkable cruelties. There are stains in my study that look like ketchup, but are not. There are sudden movements that turn on all the security lights.There is a smell that is barely masked by the nine dollar dirt that feeds her windowsill herbs. I’ve heard all these sounds before, but this one is closer, and I know why. There is a man on the other side of the door, limping, wet from the chase. He beats on the glass with the heel of his hand. I turn on the porch light because I know. I’ve been expecting him for twenty years, back from a time when my life was fraying. He took the left road and I took the right. I don’t want to see him now — for us to see each other, really — but his t-shirt is torn from armpit to belly, and I swore to him. He is older now, of course he is, but his eyes still show his fury, and mine have turned soft and careless. “Richard,” was the only word he had to say, and I knew it was time. Compelled to stir the ashes, of what was cruel, what was unadorned. And still I reach for those extinguished minutes and years, and walk into the smoke, shoulders broke, bending to grief’s provocation, aroused by what could have been. Elani was the most gifted of us, but it was hard to watch her subtract herself from happiness. She was the good girl, the kind girl, the quiet girl who leaned into the shade of a river birch while others swung from ropes and imprinted the water with their thrashing bodies. She was not destined for great things, and she did not pursue them. The current ran deep, and she found comfort in her aloneness and sandpapered memories. She had no quarrel with pain. She reconciled it as the great truth of life, and saw strength as a punch in the belly, holding back the yelps, damming the tears behind waxwork eyes. I used to be a good man. There are memories, strong, of sitting on the porch with Marcie. We drank sweet tea from jelly jars. The porch was cluttered with flower pots and lawn chairs and Marcie’s rainbow of flipflops. I rested my hand on her thigh and we watched the alfalfa fields shift in the wind, like feathers rising from water, and imagined shapes in the chameleon clouds. Sometimes I plucked dandelions from the lawn and tucked one behind her ear. She laughed, then scowled, then laughed again. Eventually, the sweet tea became bourbon, and the laughter became the deepest part of our summer nights. We were young, so young. I remember I wanted her and she wanted me, and then somewhere, somehow, we became poison to each other. I was a good man once, but that might just be a dream, a desire for long-ago soundness.